One Man Left Studios » Outwitters Sale This Weekend! Space Food Truck is officially graduating from Early Access next week, so this weekend we’re shining a spotlight on our first multiplayer strategy game, Outwitters for iOS and Android! 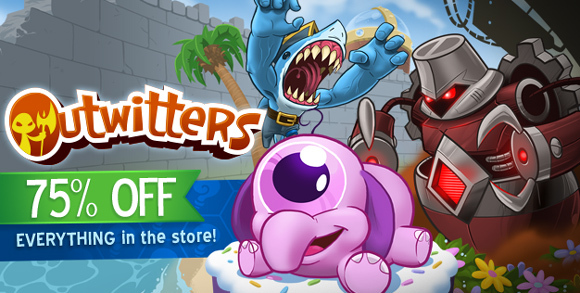 Today through Sunday, EVERYTHING in the Outwitters store is 75% off or more. Outwitters is an easy-to-learn, tough-to-master player vs. player strategy game that supports 1 vs. 1 or 2 vs. 2 matches. It even has cross-platform play between iOS and Android. You can check out the trailer to see it in action, and be sure to stop by our forums if you’re searching for a few regular opponents. Our newest game, Space Food Truck, will be officially released on Steam March 25th. You can sign up for our mailer to get an email reminder. 25 lucky subscribers are getting a free copy on launch day! Is this on google play? If so, shoot an email to us with the subject “Outwitters sale” and send over your google order # and I can issue a refund. My Outfitters store’s prices haven’t changed to reflect the promo. I am using Android. Any suggestions? Nevermind. It just updated. Sorry! In the outwitters news it stated that base avatars are free? Is this not true or is it not showing up for me? They are all free, I got all of them now. This ‘sale’ is amazing.